We know it’s all fun and games, but hey, we have to pay our bills too! That’s where registration comes in. We know you work hard to earn your money, so we try to give you the most bang for your con-going buck. Not only do we have a regular membership, but if you have some more money to spend and want to help out the convention, sign up for one of our higher levels. We’ll even give you some nice thank you gifts for giving us your extra dough. 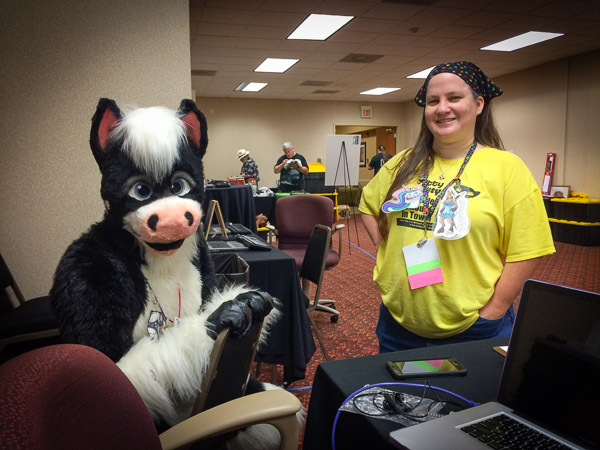 Pre-registration for MFM 2019 is now open! Click here to register! A couple of the ponies that help out in registration! Historically we tend to run out of popular t-shirt sizes fairly early in the door registration process, and we’re unable to order more. In order to get the size t-shirt you want, please pre-register. We ensure that members that pre-register receive the size shirt they requested, but door registration is first come, first served. Includes a convention t-shirt and admission to the convention. Includes membership for all three days of MFM, a con T-Shirt, and upgraded sponsor-level schwag. Includes a membership for all three days of MFM, a con T-Shirt, access to our Super Sponsor / Founder reception, and upgraded Super Sponsor’s level schwag. This level includes access to our exclusive Founders Dinner, a con T-Shirt, the Super Sponsor / Founder reception, upgraded Founder’s only schwag, and our undying gratitude. Available for Friday, Saturday, or Sunday. Allows you access to all of the day’s events. Does NOT include a T-Shirt. Can be upgraded to a full membership, including T-Shirt, after expiration. Available at the convention only. Available for ages 5 – 15 when accompanied by a paying parent and it includes the T-Shirt. Under age 5 are free, but won’t get a T-Shirt. For more information and how to register your child, please contact registration. Available for ages 5 – 15 when accompanied by a paying parent. Does not include at T-Shirt. Remember that you will need picture ID with your birthdate to register! Here’s a few dates you’ll want to be aware of. August 2, 2019: Last day to preregister and pay any remaining balances owed. Also, the last day to request a refund on a membership. August 16, 2019: Last day to request a membership rollover to next year or a membership transfer. Memberships are refundable up to the end of preregistration. After preregistration, we have to make orders for the convention, so your money will be spent at that point. If you wish to request a membership refund, please email registration. Your membership will be fully refunded, minus any service charge we incur in processing it. Rolled over membership and volunteer membership are not refundable. Can memberships be rolled over til next year? You may request that your membership be rolled over for one year. This must be requested before the Wednesday before the convention. Previously rolled over memberships and volunteer memberships may not be rolled over. If you wish to request a membership rollover, please email registration. What happens if I can not attend and don’t request a refund or rollover? Any membership packets not claimed at the door during the convention will be mailed, free of charge, to the mailing address provided to us when you registered. This will happen about a month after the convention. I can’t make it this year, but I have a friend who can. Can he have my membership? Memberships are transferable up to the Wednesday before the convention. You are responsible for any money transfer involved and once you request a transfer, it will not be undone. This means, make sure you trust your friend to pay your or have the money in hand before requesting a transfer. Also, we will not act as a matchmaker, you must have the person’s information before you request the transfer. If you wish to request a membership transfer, please email registration with the information of the person to transfer it to. Please note that they are not guaranteed to have a tshirt in their size if their size differs from yours if the request is made after August 1. Membership transfers will not take place at the convention. I have multiple names. Can I have multiple conbadges with my different names? No. Only one badge will be issued per membership. The badge if your admission ticket to the convention. For preregistration we accept credit cards (through PayPal). For onsite registration we accept cash and most major credit cards. I’m under 18, can I attend? All minors will be issued a red badge to show that they are minors. If you are 16 or 17, you may attend if you have your parent’s permission. They must fill out and have notarized it for you to attend. If you do not provide our minor consent form, membership will be denied. If you are below the age of 16, your parents or guardian must also attend for you to attend. If you have any questions about this policy, please email registration. Why must I have a picture ID with my birthdate to register? Having a picture ID makes our lives much simpler in the long run. If you have preregistered, you MUST have a picture ID to claim that registration. This is to protect you from having your membership stollen. Also, if you appear to be under the age of 18, you again MUST have picture ID to prove your age. If you appear to be under the age of 18 and you don’t have a picture ID to prove you aren’t, you will be treated as a minor and, unless you have the minor consent form filled out, you will be denied membership. The judgement of age fall solely on the head of registration and the executive staff of MFM. This is to protect the convention and the dealers from any issues that might arise from dealing with minors. Memberships that can not be claimed because lack of ID can not be refunded or rolled over in any manner. Minors (under 16) attending with their parents do not need to have ID. I don’t have an ID, what do I need to do? We understand that there are still some people out there without picture IDs. If you do not have a picture ID with birthdate, please bring a notarized letter with your physical description and your birthdate. If you have any questions, feel free to email registration and we will try to help you. To register for MFM 2019, please visit our registration website!